When you have been presented with a fundraising goal, the best next step is to determine the feasibility of that goal. One of the most challenging tasks is setting out to accomplish a fundraising goal without knowing whether or not you have the capacity to meet it. Doing so without adequate research can even be disastrous, especially in cases where other donors have made challenges or matching gifts. It is best to do some homework up front to determine if the goal is realistic. Take the fundraising goal and create a gift chart. There are online gift chart calculators that you can quickly use to give you an estimate of giving levels and the number of gifts and prospects needed. Determine the base of prospects that you are able to solicit for this particular campaign. It may be everyone, or it may be just specific program participants. Have this list of prospects wealth screened, if not already. If already wealth screened, determine their capacity rating. Some wealth screening tools will also provide you with a minimum and maximum gift ask. If you do not have wealth screening tools, it is fair to estimate that, for a major campaign, a donor prospect can be asked to give ten times more than their most significant gift to your organization. If you do not have wealth screening tools or the last gift – meaning you have some prospective donors only – then you may need to resort to doing some manual prospect research on the identified prospects to determine a basic capacity level. Once you have identified this information, you will then plug those numbers into the gift chart. For example, if you have identified five prospects at the $100K giving level then you would note that. 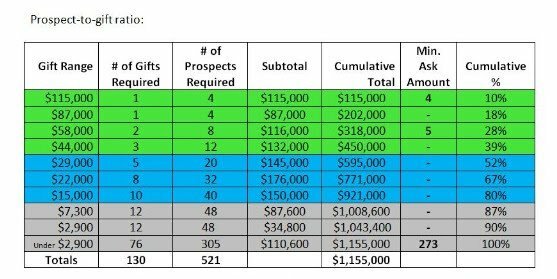 Compare the number of gifts needed and the number of prospects necessary. Determine if, based on capacity alone, you have the appropriate number of prospects to reach the targeted number of gifts. Pay particular attention to the higher gift levels (i.e., lead and major on the gift chart) because this is where the campaign will be made or broken. Ask yourself whether or not you have the number of prospects needed for each gift at each particular giving level (lead and major). If not, how “short” are you? By a lot? By a little? Remember, we are just looking at the number of prospects at this point. If you have the number of prospects needed, or maybe even more at the majority of lead and major gift levels, then great! You will likely be able to estimate campaign success. If you don’t have the number of prospects needed at the majority of lead and major gift levels, be cautious. You cannot make up these major gifts at the lower level. And, it is unlikely that you will have strong campaign success. I recommend having ample donor prospects identified for the simple fact that we are looking at one indicator alone – capacity. And, we know that capacity is a strong determinant of actual giving. So, having more prospects, rather than not enough, is critical. Finally, base your strategy recommendations on what you see appearing in the gift chart. It behooves you to do your due diligence before starting actual fundraising or even accepting a matching or challenge gift or grant. You must first know if you have the number of prospects needed to reach the goal. Otherwise, the campaign is set up to fail right from the start.